"Deer Hunter's Special" Special price on all CAMOUFLAGE ATV's while supplies last! Special Prices on all Honda & Suzuki Motorcycles NOW! Clearing out all 2015 and prior years with special prices. No reasonable offer refused! As low as 1.99% APR FIXED financing rates available on selected Honda & 0% APR on selected Suzukis. Save BIG MONEY NOW & with NO MONEY DOWN! Get your bike worked on by some of the best trained mechanics in our area. Our service department also offers Insurance Estimates, Top Quality Services, High Performance Engine Work, Tire Changes and much more! You tried the Rest ...Now try the Best! LOWEST PRICES OF THE YEAR. CLEARANCE PRICES ARE GOING ON NOW. BLOWING-OUT ALL STREET BIKES! SAVE BIG MONEY NOW WHILE SUPPLIES LAST! LOW FIXED FINANCING RATES. Save your "Hard Earn Money" on NON-CURRENT models left in stock. Deals have never been better. 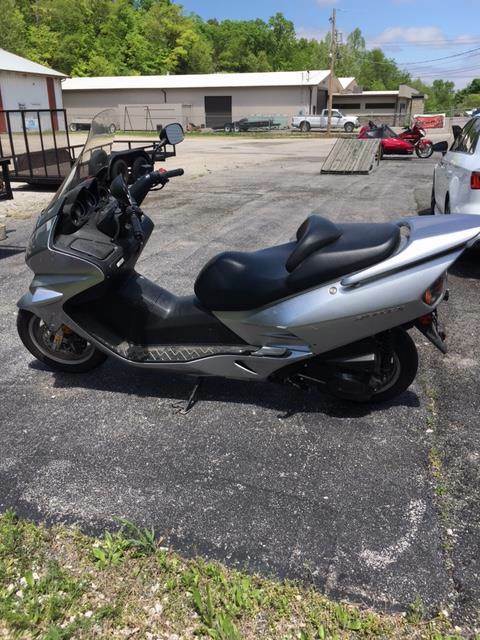 So come & ride with Twin City Honda/Suzuki by your side... Let us get your motor runnin' and head out on the highway! 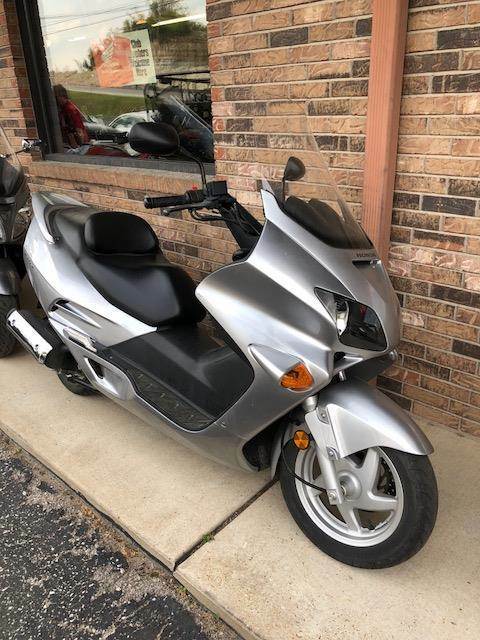 Reflex® (NSS250) with only 2K miles & great shape! How many ways can you have your Reflex®? Just about every way you can imagine, including the Sport edition that boasts a slick windscreen and plenty more unique features. Meets current CARB and EPA standards. Reflex Sport edition includes short sport-style windscreen, chrome grabrail with integrated backrest, one-piece chrome handlebar and cover, chrome sidestand and handlebar caps. Wind-tunnel-developed full-coverage bodywork and windscreen are both beautiful and functional, protecting the rider from the elements while reducing wind noise. Large air vent mounted in the front cowl feeds air behind the windscreen to minimize low-pressure turbulence around the rider. Integrated floorboards angle upward in the front for optimum rider foot placement when riding. Floorboards narrow below the seat to allow the rider to place both feet on the ground easily. Folding, cast-aluminum passenger footrests are integrated into the Reflex's supersport styling. Fully integrated four-meter instrument display features analog displays for tachometer with 8300-rpm redline, speedometer, fuel level and coolant temperature. An easy-to-read LCD clock is mounted in the tachometer face; LCD readouts are also provided for odometer and tripmeter. Indicator lights display turn-signal and high-beam operation and parking-brake application. Flush-mounted dual headlight design features computer-designed multireflectors with one left-side-mounted 55-watt H7 low beam and one right-side-mounted 55-watt H7 high beam; the asymmetrical low-beam mode is complemented by the operation of both lights in high-beam mode for superb lighting in nighttime riding conditions. Integrated S2000-style rear taillights complement the Reflex's sporty appearance. 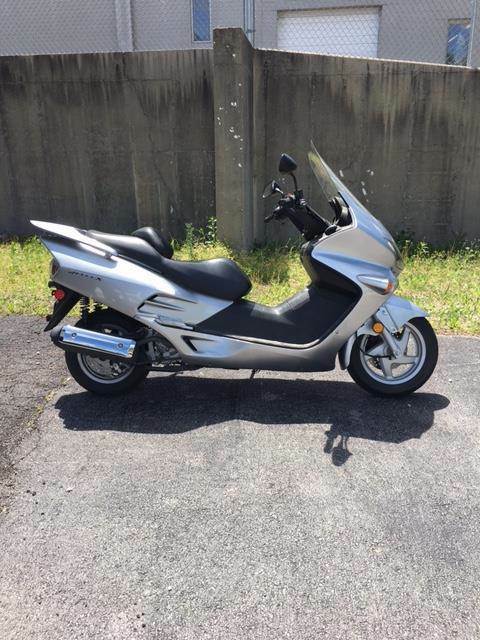 Painted aluminum rear spoiler complements the Reflex's aerodynamic profile and features passenger handgrips. Handlebar-mounted rearview mirrors utilize sporty housings. Wide, low, padded seat has an adjustable six-position rider backrest that adjusts over a 2-inch range. The long, wide passenger seat is very comfortable for all-day two-up riding. The spring-loaded locking seat opens to the side, allowing easy loading of the storage compartment. Large-volume, lockable 33-liter underseat storage compartment is large enough to store a briefcase or helmet. A convenience lamp illuminates the storage compartment in low-light conditions. Lockable 7-liter front storage cabinet features two cup trays built into the door. Large 3.2-gallon fuel tank offers extended cruising range. The fuel door is located behind a locking cover in the frame well between the floorboards. Convenient cable-operated parking brake is engaged by pulling a large handle on the upper-right panel. Pressing down on the handle releases the brake. Powerful 12-volt electrical system and maintenance-free battery offer superb reliability. Ignition switch / steering lock helps keep the Reflex secure when parked. Sidestand switch allows starting only if the sidestand has been retracted and the rear-brake lever is applied. Handlebar switches and controls use internationally approved ISO graphic symbols. Durable steel frame is lightweight yet strong, providing an optimum combination of rigidity and flexibility for superb road handling. Stout 33 mm hydraulic front fork with 3.9 inches of suspension travel provides a plush, well-controlled ride. Dual rear shocks have 4.7 inches of travel and seven-position spring preload adjustability for a smooth, comfortable ride. Rearward mounting of the rear shocks allows a large-capacity underseat storage compartment. Hydraulic 240 mm front disc brake and lightweight 220 mm rear disc brake offer excellent stopping power. The Reflex's Combined Braking System (CBS) features a three-piston front-caliper and a single-piston rear caliper. Rider application of the front brake lever activates the two outer pistons of the front caliper. Application of the rear-brake lever, mounted on the left handlebar activates the single piston of the rear caliper and the center piston of the front caliper. When only the rear-brake lever is used, an inline delay valve smooths application of the front-caliper piston. Optionally equipped anti-lock braking system (ABS with CBS) model features an electric-motor-driven modulator that provides rapid and precise braking-pressure adjustments, resulting in smooth ABS operation. The system incorporates an integrated electronic control unit (ECU) into a simple one-piece design, self-diagnostics with an interactive ECU test function and automatic protection against system failure. Stylish five-spoke cast-aluminum wheels are lightweight and strong. Large 13-inch 110/90 and 12-inch 130/70 tires provide excellent traction. Powerful 249 cc liquid-cooled four-stroke engine produces impressive power for quick takeoffs and passing. Aluminum cylinder head features a 10.5:1 compression ratio. Its design is optimized for maximum intake velocity, providing immediate response at low- to midrange speeds, and excellent cruising and passing power at highway speeds. 30 mm constant-velocity (CV) carburetor offers superb throttle response and excellent fuel mileage. Maintenance-free, fully transistorized ignition ensures immediate and reliable power. Auto-enriching system eliminates the need for a manual choke. Air-injection system ensures efficient combustion of exhaust gases and reduces exhaust emissions. Fan-cooled radiator ensures consistent engine operating temperatures and long engine life. The radiator is located in the base of the frame, maximizing storage-bin capacity. Push-button electric starter provides quick, effortless starting. Lightweight and quiet exhaust system. Honda V-Matic belt-drive system provides sophisticated three-stage operation, matching the engine's strong low- and midrange power to a wide range of operating conditions. 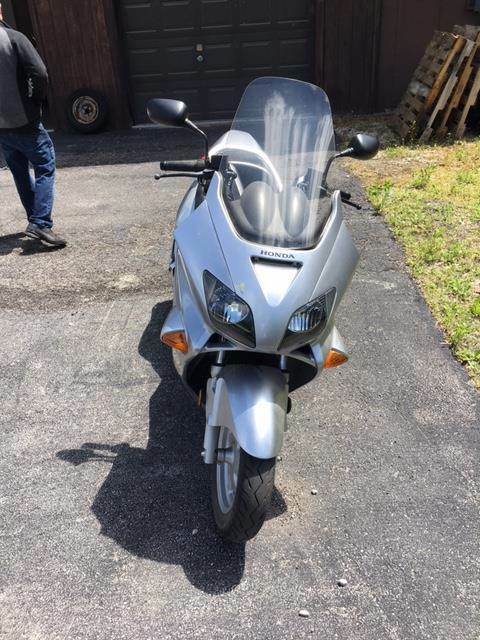 Stage One delivers efficient, quiet power for around-town cruising; Stage Two provides increased power for moderate acceleration; and Stage Three provides maximum power for full acceleration and top speed. Reflex® and Reflex ABS are available in Light Silver Metallic. Reflex Sport and Reflex Sport ABS are available in Red. *Prices DOES NOT include government fees, taxes, dealer freight/preparation, dealer administration fees nor any finance charges. Final actual sales price will vary depending on options or accessories selected. These prices reflects using all Honda & Suzuki rebates and special customer bonus buck rebates (if applicable).